When virtual reality became a real product we could have in our homes, the platform promised the potential of lush, engaging, and fully realized worlds. We’re still working toward that future, but while we’re waiting, Beat Saber offers one of virtual reality’s best experiences. It doesn’t create a new world to explore; instead Beat Saber focuses on placing you in a song and giving you the tools to participate in its rhythms in ways that traditional music games can’t. In Beat Saber you use two light swords (one blue and one red), and you swing them using Move controllers. Red and blue blocks fly toward you, indicating which saber you should use to hit them. Along with being color coded, the blocks also have arrows dictating the direction of your chop. A blue block flying at you on your right with an arrow pointing north requires you to attack it from the bottom swiping upward. A red block coming from the left with an westward pointing arrow requires you to swipe through it from right to left. These blocks fly at you in time with the music booming in your ears, and when you find the rhythm and take down each block, you feel like you’re conducting a violent symphony. It’s beautiful. A clinical description of how the gameplay works really doesn’t do it justice. Wielding lightsabers to destroy blocks as the music and light show fully envelops you lets you focus on the task at hand with extreme precision. The music and visuals fully take over your peripherals, engrossing you and making you feel the music. It wasn’t long before I was slashing blocks based purely on the rhythm, embracing the choreography of each song and focusing less on the arrows on the blocks. It makes the experience a fantastic showcase for the platform and genuinely feels like something that wouldn’t work outside of a headset. With driving beats and dance-worthy intensity, every song is enjoyable and perfect for the style of gameplay Beat Saber offers. However, compared to other rhythm and music games, the diversity isn’t there. The original soundtrack (no licensed songs here) stays rooted in techno-centric beats, and there are only 16 so you end up playing the same songs a lot. Despite the repeated songs, the gameplay doesn’t grow stale. Early on, you simply grasp for high scores, but you eventually encounter tasks like completing a song without making wide arm movements, or missing a specific number of blocks without failing. The campaign also offers a deep challenge, dipping into the extreme difficulties before showing you the finish line. 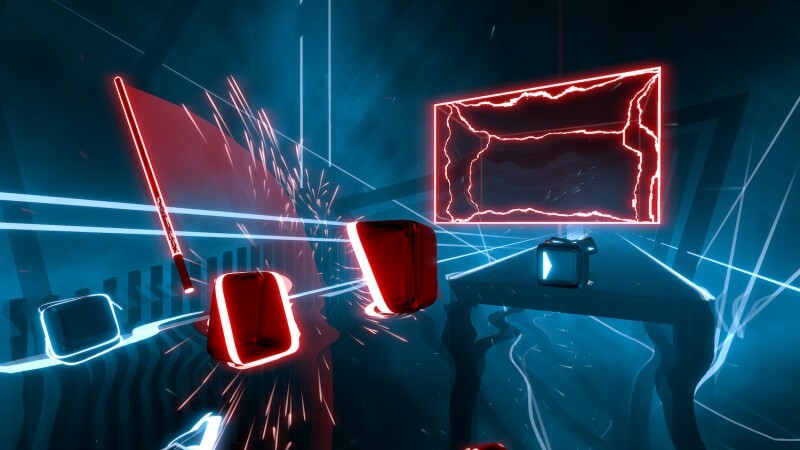 Even if you’ve been playing Beat Saber for months in early access on Vive and Rift, the campaign offers a worthwhile and enjoyable challenge. You have an assortment of options for tackling songs outside of the campaign. You can do no-fail mode (helpful for learning the more difficult songs), play without arrows on the blocks, or play with single-color blocks. You can also elect to turn on modifiers for score boosts, like playing a song at double speed or making the arrows disappear from the blocks right before you swipe through them. I liked all these modifiers and how they added gameplay variety, which is important considering the small track list. Beat Saber is a must-play for anyone interested in virtual reality, but not for the reasons we typically associate with the platform. It won’t make you crane your neck to take in the majesty of your surroundings, but Beat Saber uses VR to place you into the music and taps into your carnal desire to hit things with swords. Years into its life, the gaming public is still unsure of this new way to play video games, but Beat Saber has the potential to convince skeptics to take another look.